Title: The Gong of Doom! Synopsis: Continuing directly from Man-Thing #2, a Himalayan avalanche cascades down on Man-Thing and the terrified Elaine, burying the two as Roger Grafton, the man responsible for the disaster, stalks away with a scheme on his mind. Elaine and Man-Thing climb out of the snow and are immediately set upon by a tribe of Abominable Snowmen who take them prisoner and bring them back to camp. We learn that the tribe is led by a human anthropologist named Hiram Swenson, who was found by the beasts after being beaten nearly to death by his Sherpa guides during an exploration years ago. They nursed him back to health and he became their leader, developing a hatred for civilization and wanting to protect his people from the outside world. Swenson condemns Elaine and Man-Thing to death, but one of the Snowmen believes that Man-Thing is an invincible mastodon from mythology that signifies the death knell of their culture. 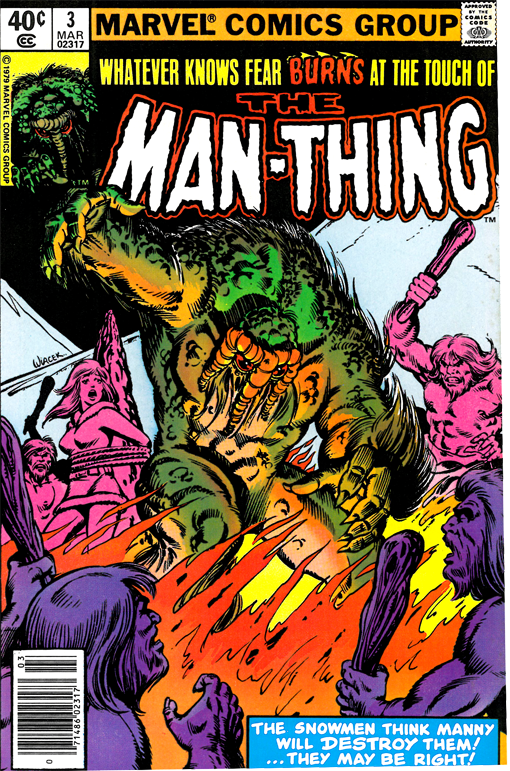 Just as Elaine and Man-Thing are about to be burned at the stake, Roger Grafton and his team burst onto the scene. They gun down the Snowmen so that they can capture Man-Thing and bring him back to civilization to be exhibited as a freak of nature. They lower a cage around Man-Thing, but he escapes and burns Roger Grafton to death with his touch. The snowmen start an avalanche, but Man Thing manages to grab Elaine and the ski pontoon of the passing plane to escape as the issue wraps up with another cliff-hanger.